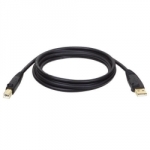 Tripp Lite Printer Cable Extension is backwards compatible and can also be used with the older USB 1.1 cables. Made with superior foil shielding for reliable error-free data communications. Features connectors and copper contacts for superior conductivity. The significantly faster data transfer rates of USB 2.0 makes it perfect for multimedia applications. Manufactured with molded connectors and integral strain relief for extra durability and long life. Connectors and contacts for superior conductivity. Premium double-shielded cables with tinned copper braid and aluminum Mylar foil. Molded connectors for integral strain relief. 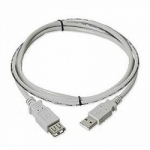 Compatible with USB 1.1 or 2.0 powered devices. Supports faster data transfer rate (1.5 to 480 Mbps) for low speed and high speed devices including multimedia applications.